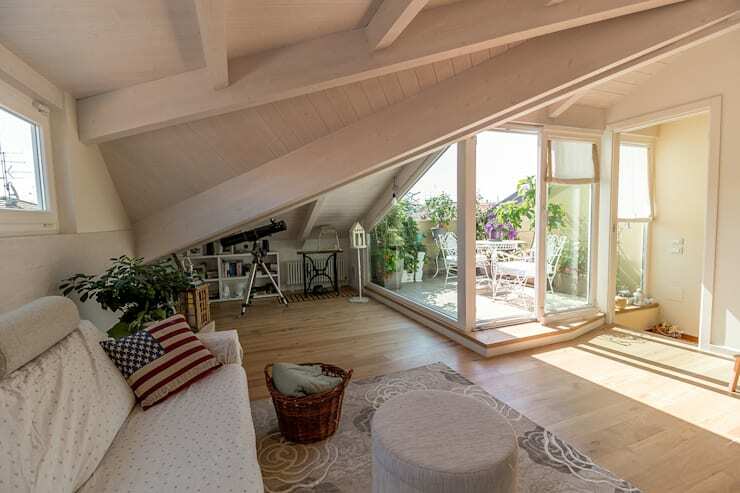 This romantic and picture perfect attic in the Italian town of Pesaro was once a dark and dingy little space which was renovated from scratch for a dreamy and cosy effect. The roof especially was structured to introduce more headroom, while a terrace was designed to integrate the indoors with the outdoors beautifully. 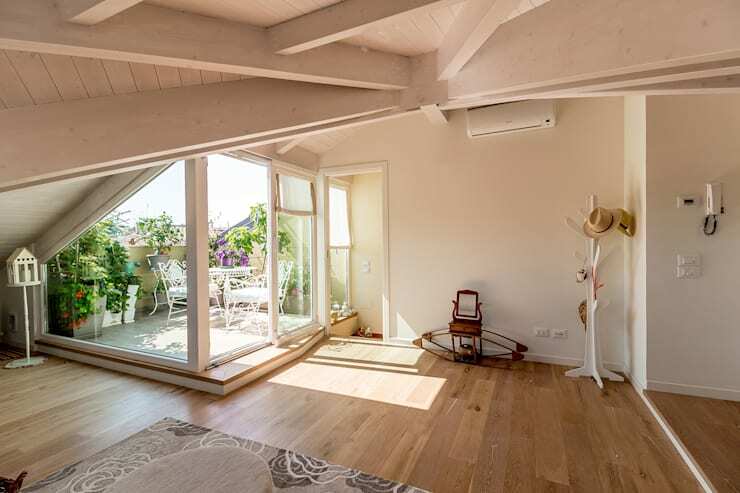 Wood is the primary building material of this abode rendered by the architects at Bartolucci Architetti, since it is both energy-saving and visually appealing. This stylish and quaint residence receives ample sunlight and fresh air, and is filled with relaxing textures which make for a positive mood. Finished mainly in white and light-hued wood, the living area is a delightful and homely space decked with cosy furnishing. 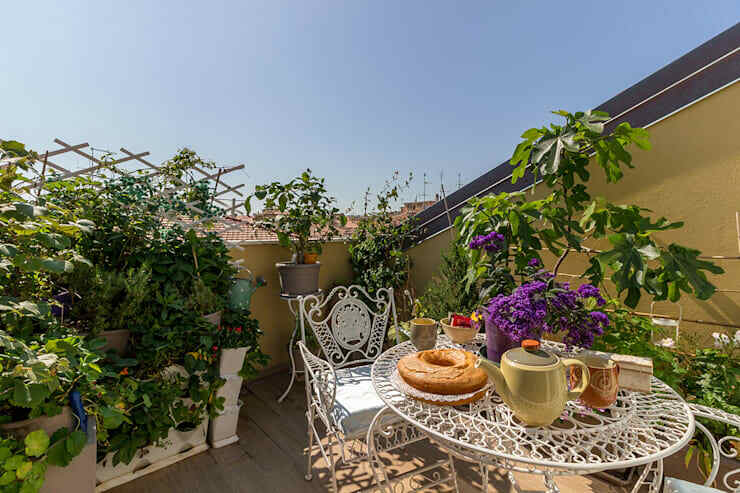 The quirky angles and slants of the roof lends oodles of personality and originality to the home, while a telescope, a traditional sewing machine and a wicker basket contribute to the vintage charm. Small nooks have been cleverly used to house shelves, while indoor greens add a refreshing touch here. Stylish glazing separates the sunny terrace from the living space, but allows natural light to flood the interiors generously. When the door stays open, ample ventilation is ensured. A quirky rocking chair and a trendy hat stand add character to this corner, while the wooden floor promises warmth. A half wall separates the cosy living space from the minimalistic bedroom, and features in-built shelves which hold books and photographs. What a smart idea to merge different functionalities without ruining the aesthetics of the home. Also note how the sleek windows behind the couch allow sunlight to enter the room effortlessly. The half wall we just saw houses the modern fireplace and niches for storing logs. Accompanied by an old-world wicker basket and fireplace irons, the setting looks extremely cosy and inviting. Generously lined with lush greens and vibrant flowering beauties, the terrace is a sun-kissed heaven for lazing around or enjoying tea on weekends. The ornately crafted wrought iron furniture makes for charming outdoor seating, while simple but stylish planters add dashes of elegance. Large grey tiles on the floor and pristine white environs make this bathroom modern as well as neat. A large but sleek wooden under-sink cabinet offers adequate storage space, while the mirror lends the illusion of extra space. 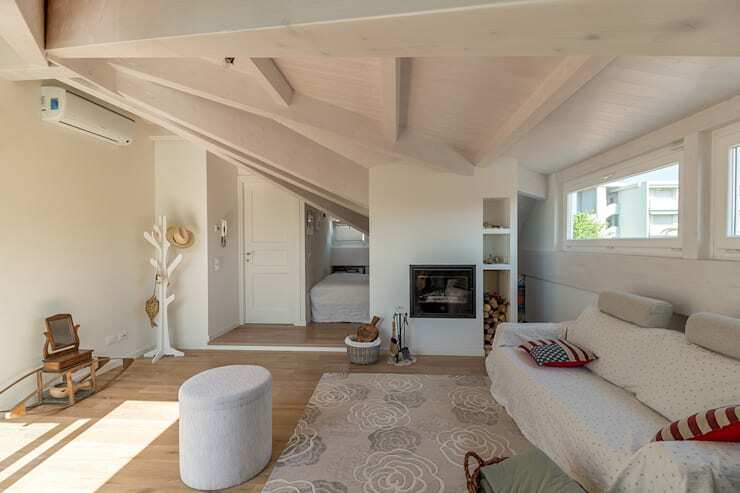 Impressed by this compact yet enticing attic home in Italy? 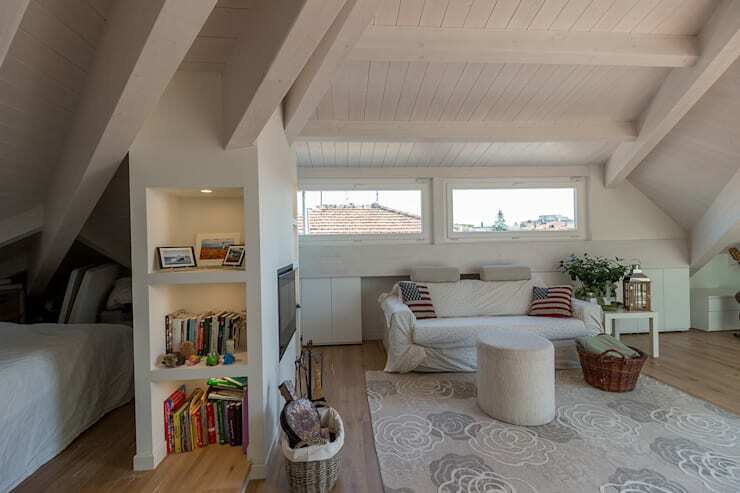 Check out another tour for more ideas - The Perfect 1,300 Square Feet Home For A Family of 5.